Pensive Mischief: Nightmare Factory - Back For More! 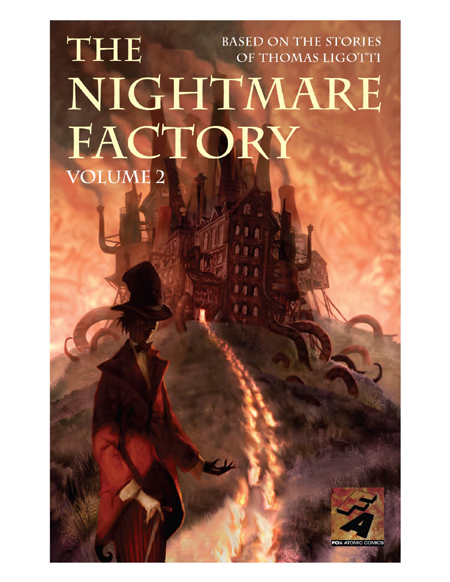 Nightmare Factory - Back For More! As with the previous volume, this is a gorgeous package courtesy of HarperCollins and Fox Atomic Studios -- lovely paper, lush color throughout. My two collaborators really did a fantastic job, and you can't go wrong with the rest of the talent on the book. Heidi Macdonald, editor of the volume, talks about it here . You can read a couple of early reviews here and here. We'll be doing promotion around Halloween -- I'll post a schedule when I have it. And I've got more projects to announce soon, so watch for this blog to get a lot more active (he said, filled as always with fresh hope). Stuart Moore is a writer, a book editor, and an award-winning comics editor. Recent comics writing includes DEADPOOL THE DUCK (Marvel), DOMINION: LAST SACRIFICE (Amazon/Jet City); and EGOs (Image). Novels include THE ZODIAC LEGACY, a Disney series created and cowritten by Stan Lee, and THANOS: DEATH SENTENCE (Marvel). Other comics work includes WOLVERINE NOIR and NAMOR (Marvel); assorted Star Trek and Transformers projects; and the science-fiction graphic novels EARTHLIGHT, PARA, SHADRACH STONE, and MANDALA. Prose writing includes the novel version of Marvel’s CIVIL WAR and Disney Worldwide's JOHN CARTER: THE MOVIE NOVELIZATION. Stuart also serves as freelance editor of Marvel Comics’ prose novel line. In the past, he has been a book editor at St. Martin’s Press and editor of the Virgin Comics / SciFi Channel and Marvel Knights comics imprints. At DC Comics, he was a founding editor of the acclaimed Vertigo imprint, where he won the Will Eisner award for Best Editor and the Don Thompson Award for Favorite Editor. He lives in Brooklyn, New York, with his wife, author Liz Sonneborn. Star Trek: Constellations (prose anthology featuring my story, "Chaotic Response"